May 2016 – THE BOOKS THAT TIME FORGOT. The Eden Project has returned and Rourke must find a way for the six space shuttles to land. 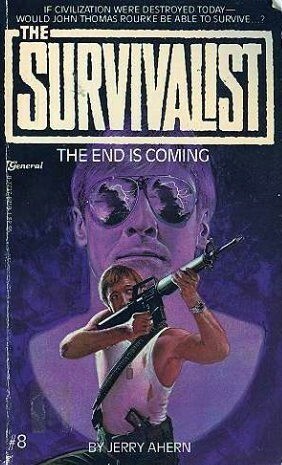 They find out that there are other survivors on the planet. A Soviet underground city has survived. An old enemy Vladimir Karamatsov has survived his gun fight with Rourke. Like him he and a number of his followers were able to survive in suspended animation. He now wants revenge and strikes seriously wounding his son and kidnapping the other members of his family. 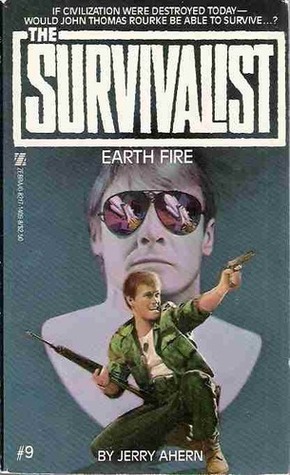 Now Rourke must save his family and successfully bring down the Eden Project. Also another civilization has survived. A group of Nazis had built an underground city in Argentina. Now they also are a threat. How will civilization survive the twin threats of the Soviets and Nazis. So there are other survivors after the Great Conflagration. And of course they happen to be advanced societies of Soviets and Nazis. Well I suppose the future would be boring if there wasn’t some threat but Nazis and megalomaniac KGB agents. A very grim outlook for Rourke’s family and the returning Eden Project. It was a surprise that they resurrected Karamatsov. I thought he was safely dead back in #3 but he’s back and completely psychotic. A great setup for conflict in future books. The Great Conflagration has scoured the Earth’s surface of life but Rourke was able to get cryogenic chambers for his family and friends. He has a plan that is a bit radical. He awakens twenty years before the five hundred year mark when the Eden Project is supposed to return. He revives his 10 year old son Michael and 8 year old Annie. He trains them for five years and then goes back to sleep. The plan is that when the adults revive they will be the same age as his kids. Well Michael and Annie do grow up. 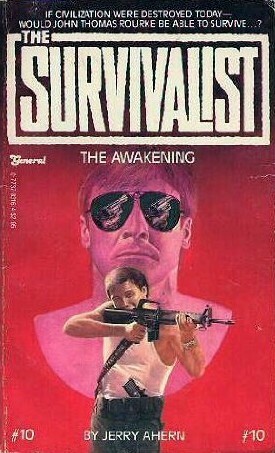 Just days before the scheduled awakening Michael sees a plane go down in the distance. 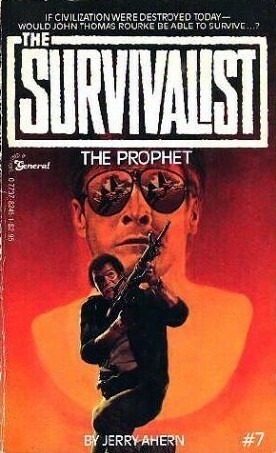 He sets out to investigate and finds a tribe of cannibals. He rescues a girl named Madison and finds she is from a community of one hundred people. When one is born then someone is expelled. The community was a survival retreat for some rich families. After the Conflagration the servants revolted and instituted this population control. The cannibals are from the expelled. Rourke and his friends come and rescue Michael but the community commits mass suicide when they read the diary and find out the truth. The story ends with the Eden Project returning and a hint of an old villain that’s still alive. 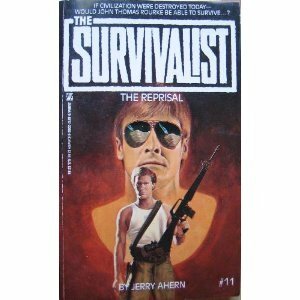 So begins the new story arc for the Survivalist. It is a kooky idea Rourke implements and as I read it now probably a bit dangerous. Obviously his wife Sarah freaks out at this which will cause a lot of tension in future stories. Otherwise the book is mainly setting up the future world. It’s mainly Michael and Annie’s story. There is also proof that there are other survivors and some are technologically advanced. It also hints at a sinister old enemy from the past. The Earth is doomed. In days the ionization of the atmosphere will cause a firestorm that will extinguish all life on Earth. Colonel Rozhdestzenskiy is setting himself up to be the master of the world. At the Womb formerly Cheyenne mountain in Colorado he has assembled two thousand of his followers to be put into suspended animation. In five hundred year they will awaken, destroy the returning Eden project and be the undisputed ruler of the world. General Varakov is a dedicated Communist and patriot but can’t see that such evil be allowed to triumph. Gathering Rourke and his niece Natalia the two together with a small group of Soviet special forces and U.S.II troopers will penetrate the Womb and destroy it. 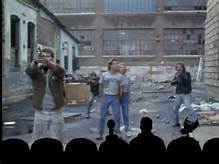 This small group after a bold attack succeeds in destroying the Womb and taking some of the chambers and formula to save Rourke’s family after the Earth bursts into flames. So all the plotlines finally come together. This is the end of the first story arc in this series. It was real exciting story with a lot of action and a grand apocalyptic ending. We get to see that not all Russians are evil and this was an interesting direction to take the story. Instead of endless fights with the Soviet occupiers Ahern is taking the Rourke family into a far new future. The possibilities are endless and the next story was eagerly awaited. All the characters that didn’t make it were given dignified endings and Rourke at the end had one final defiant act in confronting Rozhdestzenskiy as the world is bursting into flame. A real excellent story. Rourke finally tracks down his family in Tennessee. The reunion is short lived for after he gets them safely to his hidden retreat he must go to Chicago. With Natalia the two must somehow make it past Soviet occupation troops to Varakov’s headquarters at the Museum of Natural History. Once there he finds out the horrifying truth. The nuclear war has caused the atmosphere to ionize. Soon the atmosphere will burst into flames destroying all life on Earth. The Americans had launched the Eden project. Six shuttles with 137 men and women from all the democratic countries. Suspended in cryogenic sleep and on an elliptical orbit that will take them back to Earth in 500 years. But KGB Colonel Rozhdestvenskiy has a plan of his own. At the Womb formerly Cheyenne mountain in Colorado he has assembled 2000 men and women. They will also go into cryogenic sleep with the technology they recovered from the Johnston Space Center. In 500 years they will use particle beam weapons to destroy the returning Eden project. Thus making Rozhdestvenskiy the undisputed master of the world. Now Rourke must stop him for the future of the world. Finally the plot threads are coming together. Rourke finally finds his family. We learn the secret of the Womb and the Eden project. It sets up a truly apocalyptic scenario that you just have to find out how it ends. This book had a lot of action and was a very satisfactory read. Rourke, Rubenstein, Natalia and the other members of the shore party from the submarine are able to get through the wildmen that populate the new west coast. They find that Filmore air base was neutron bombed and still intact. A dozen personal did manage to survive and one is Rourke’s old friend General Teal. It is soon after that Captain Regis Cole reveals his true self. 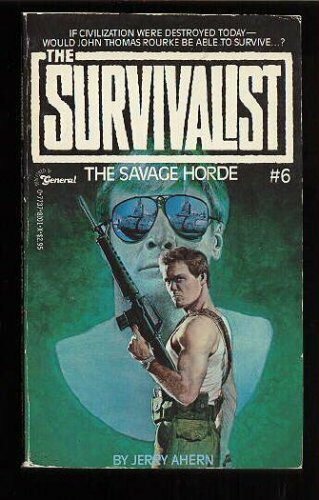 Cole and his men brutally murder the shore party and the survivors while taking Teal to lead them to the nuclear missile bunker. Cole is able to make a deal with the leader of the wildmen who was a cult leader before the war and has taken advantage of circumstances to increase his flock. Cole offers him control of one of the missiles. The other five he wants to use on Chicago. He wants to break the back of the Soviet occupation of America and destroying the Soviets main beachhead would effectively end their occupation. If a million or so Americans have to die in the process well too bad. Cole is a white supremacist that killed the real Cole and took his identity. Now Rourke and his friends must stop him from his insane plan. The seventh book is another action packed story. We already knew that Cole was somehow up to no good and sure enough he is one major dickweed. Rourke is able to stop him in the nick of time and with an appropriated F-111 is able to make it back to Georgia with his friends. He also acknowledges his love for Natalia setting up an awkward love triangle and at the end he rescues a resistance fighter that knows the location of his family. The story threads are set to come together in the next book. 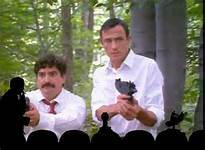 Well its time for another Rifftrax live. This one was Time Chasers a classic from the Sci-fi (before it was spelled with a y) era. The show started off with a short from the 1920’s or ’30s. It was about a chimp who was a mascot at a fire station. The chimp does what a chimp would do with his funny antics and threatening to tear off peoples faces. Thankfully he’s there to distract from the house burning down. So on to the movie. A big chinned guy who wears a Castleton t-shirt has invented a way to travel through time using his Cessna and a Commodore 64 computer. Now all he needs is money. 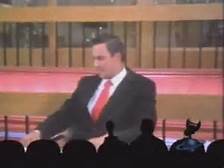 While watching the late movie an ad comes on with a commercial from GenCorp. The CEO obviously is a caring man. Why we know that? Because he says so. Well big chinned guy decides that’s the place to get funding. But he has to deceive an executive with a bogus claim of a fuel system to get him to come and see his plane I mean time machine. 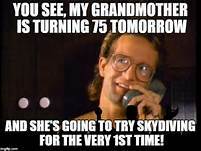 Oh he wants some press coverage so he makes up a story about his grandmother skydiving. So a little guy in a pink suit and his old high school flame who is a reporter comes and are initially disappointed at the lie. But they do take a ride and get to see the Socialist paradise of 2041 Vermont. 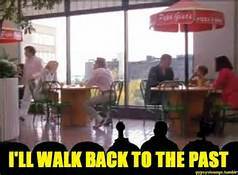 A future with everyone in spandex, bicycles, recycled buildings and food courts that look unchanged from the twentieth century. Food courts of the future. Well the caring CEO loves the time machine and agrees to take care of everything. So our big chinned hero goes on to date his old girlfriend without a care in the world. Then on a date through time the two go back to 2041 only now everything has changed. Everything is in ruins and people dressed as ads for Old Navy run around with guns. Something bad has happened. Well they confront the CEO and guess what? He’s actually evil. Wow!! What a shock. They barely escape from his atrium/office in the mall to catch a taxi by a guy from New York, New York. Driven by a New Yorker with the worst accent I ever heard. The powerful CEO’s office in the mall atrium. So its off on a chase through time. A time that sees them eventually end up in 1777 with warring colonials and redcoats. Evil CEO and his lackey. Thankfully the evil CEO is defeated in battle and the time line is saved. Evil CEO vs. big chinned guy. 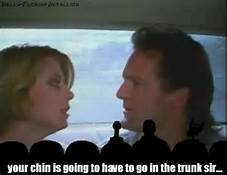 So this is a classic from the old MST3K days. I enjoyed this movie. I mean its obviously bad but it does have good production values and a story I could follow and found interesting. Made by a small company in Vermont it has that charm of a small production made in Vermont. The guys had some good riffs and this an enjoyable evening. Our hero perplexed about the movie. And the official trailer for Time Chasers. Rourke has reunited with Natalia and Rubenstein in Georgia. Natalia has a message from her uncle for Rourke but first the three must save a group of soldiers from Brigands. The soldiers lead by a Captain Regis Cole have been looking for Rourke. They have a mission to go to an airbase in northern California. There they will retrieve six nuclear missiles. They want Rourke because he knows the base commander. 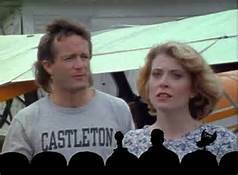 Now Rourke isn’t interested but must come along because he needs the medical facilities on the nuclear sub they are using after an altercation gravely wounds Natalia. The sub arrives at the new West Coast that has been drastically altered by the war. The San Andreas fault was activated by bombing and slid the coastline into the sea. They find the new Northern California overrun by hordes of religious fanatics that like to burn heretics on crosses. Rourke also has suspicions about Cole’s agenda. So California is full of nuts before the war and still full of nuts after. We get to visit the west coast to see what happened in that part of the country. A sidetrack from the main quest but an entertaining story. Cole is clearly a douchebag and it is obvious that there is some sinister motive in his quest for the nuclear missiles. Sarah and the kids are still fighting for their lives. First they are driven out of the house they have taken shelter in by Brigands then out of the refugee camp by Soviet soldiers. While this is going on the KGB are stockpiling supplies at a mysterious base in Colorado called the Womb. All of this sets up an exciting story for the next book in the series.